In this topic you will learn how to customize the video settings for a portal experience. Make sure you republish the experience after making any changes to the Video settings. The Video Download settings provide the ability for viewers to download videos. The download link can be used to download the highest quality rendition. Provide a download link based upon a custom field value - Video downloads will be provided based upon a custom field value assigned to the video. When selecting this option, you define a custom field and then set that field to true for any video that can be downloaded. For complete steps on configuring a download link for each video, see Downloading Videos from a Portal Experience. Note: The video must have at least one MP4 rendition available. Note: Video downloads are not supported on iOS devices. Show related link for each video - If checked, will display the related link for the video next to the video name. For more information on configuring a related link for a video, see Editing Video Properties using the Media Module. Use long description (if available) on video detail page - If checked, the video long description will be displayed on the video detail page (instead of the short description). 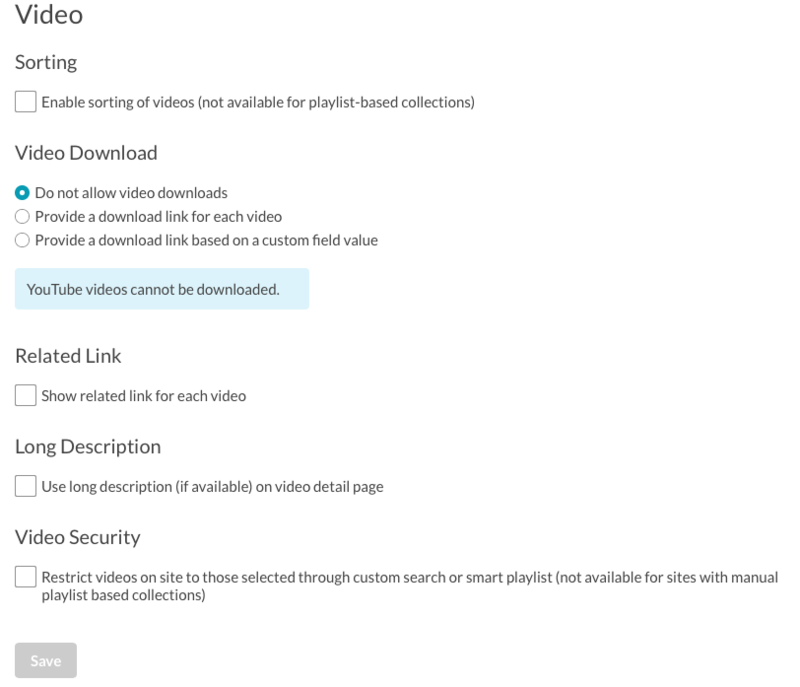 Restrict videos on site to those selected through custom search or smart playlist - If checked, when search is enabled for the experience, only the videos in collections will be searched (search will only return videos that were added to a collection using a smart playlist or using a custom search). Also, if viewer tries to access a video that has been removed from a playlist, they will be redirected back to the experience home page. If this option is not checked, when search is enabled for an experience, all videos in the Video Cloud account are searched (unless the include/exclude tag option is used). Note: If this option doesn't appear, contact your Brightcove Account Manager to get it enabled.